As Jane Hirshfield writes in Nine Gates: Entering the Mind of Poetry, “Images…are forms that let us inhabit abstraction as if from within, and so begin to know our kinship with the wide field of being.” I love that sentence although I admit, I need to ponder it a bit each time I read it. Here’s my version: imagery appeals to our senses, and our senses create the foundation of how we, as human beings, relate to each other. Imagery, then, is an important building block of literary works. 1. Choose a poem you’re open to revising. Underline or highlight all your concrete images. Remember that these appeal to the senses. 3. Circle all your thoughts. Reflect: What kinds of “thoughts” do you write most often? Conclusions? Naming emotions? Explanations? Summaries? 4. Decide to delete those thoughts or replace them with imagery. I often remind myself to “let the images do the work.” If I have both a thought and an image that shows the thought, it’s a no-brainer to delete the thought. Allow your readers to interpret the image. 5. Also consider your underlined images. Are they sharp enough? Precise enough? Replace or sharpen those that need it. Sometimes sharpening means to use more specific of more precise words: not a “small car” but VW Beetle, not “red” but cherry; not “hot” but searing; not “cup” but coffee mug; not “flower” but iris. Here’s a more radical revision activity to strengthen imagery in your poems. A shimmering image or object is one that has multiple functions and can help add depth and/or push our imaginations into new territory—as long as we substitute vague language with concrete detail. 1. 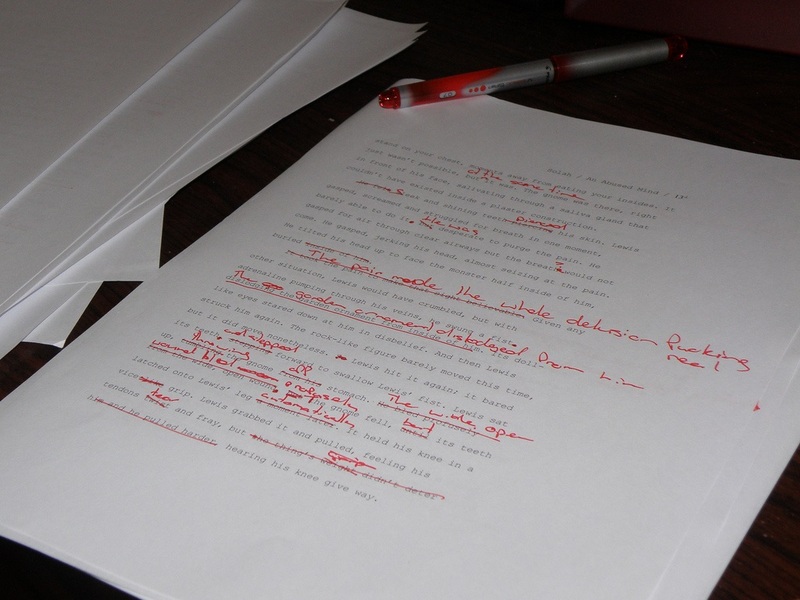 Highlight the important images and/or objects in a poem draft. Do any objects/images represent tension, conflict, or paradox? Suggest symbolism? Are valued by a speaker? Appear repeatedly? 2. Lift out one object and “transfer” it to a clean piece of paper, copying it and any description of it on the clean sheet (or blank document if you’re using a computer). Use the following discovery questions to deepen, expand, or otherwise explore your object. This is just a brainstorm—you need not write in lines for this part of the exercise. If you get stuck on one, just skip to the next. The goal is to generate more material than you’ll need. a. What does this object look/taste/smell like? b. Does it make noise or can it if manipulated? c. What does this object feel like? d. Is there a hidden aspect “beneath the surface” that one can’t see? e. Who made this object and why? f. What purpose(s) does this object serve? What purposes does it not serve? g. Who owns or possesses this object? How did that come to be? h. Why is this object important to the poem? i. What is the dictionary definition of this object? j. Are there any important cultural or contextual associations? k. What are the variations/types of this object? l. What might this object look like in its various incarnations? (e.g. : tree: pulp, boards, sap, paper, ash). m. What might the image/object be considered a metaphor for? 3. Incorporate the best from this exercise into the draft of your poem. Or perhaps it will generate or whole new poem or series of poems! Featured image by Benjamin Solah, under the creative commons license. love this web site. Thanks, I will try and check back more often. How frequently you update your site? I am glad you are enjoying the site! We have been updating it weekly for a few months now. It updates on Monday mornings.